WOODS HOLE, Mass.—The often damaging impacts of intensive agriculture on nearby streams, rivers, and their wildlife has been well documented in temperate zones, such as North America and Europe. Yet a new study in an important tropical zone—the fast-changing southern Amazon, a region marked by widespread replacement of native forest by cattle ranches and more recently croplands—suggests that at least some of those damaging impacts may be buffered by the very deep and highly permeable soils that characterize large areas of the expanding cropland. The study, led by Christopher Neill, director of the Ecosystems Center at the Marine Biological Laboratory (MBL), is published this week in the journal Philosophical Transactions of the Royal Society B. 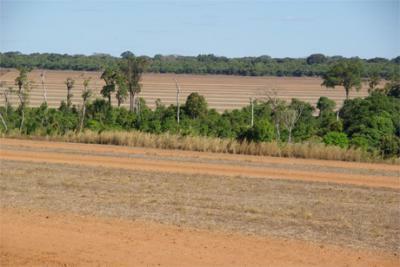 This entire journal issue is devoted to the consequences of massive land-use changes in Mato Grosso, Brazil, the Amazon's biggest and most dynamic agricultural frontier. "Over the past two decades, Mato Grosso has experienced both the highest rates of deforestation (mostly for pasture and soya bean expansion) and the greatest reduction in deforestation rates (associated with [government] policies and macroeconomic factors) in the Amazon," write the editors of the issue, who include Neill's collaborator Michael T. Coe of Woods Hole Research Center. "The regional focus of this issue allows for a deep assessment of the complex ecological and social changes related to agricultural transformation of a tropical forest environment." Neill's study looked specifically at the impacts of soybean agriculture on water quality and quantity at Tanguro Ranch, a nearly 200,000-acre farm similar in climate and geography to large tracts of the Amazon where soybean production, largely for export as animal feed, is expanding rapidly. The ranch has watersheds that are entirely forested, as well as watersheds that are now entirely soybean cropland, allowing for a comparison. "We were surprised to find that, despite intensive agriculture at Tanguro Ranch, the streams do not appear to be receiving a significant amount of either nitrogen or phosphorus, despite a high application of phosphorus fertilizer to adjacent cropland," says Neill. However, this situation is in transition, he notes. "The southeastern Amazon is a very fast-moving environment of change. Right now, most soybean fields are not fertilized with nitrogen. But that will change because the Amazon is poised for large increases in nitrogen fertilizer use as double-cropping (soybeans plus corn) becomes more prevalent," Neill says. "So it's quite possible we will see greater effects on water quality in the future." The study also noted impacts of deforestation on the quantity of water entering streams. Typically, after a forest is cut down, about four times more surface water runs off into small streams because of reduced evaporation to the atmosphere. However, at Tanguro Ranch, rainfall infiltrates quickly into the soil and streams are fed predominantly by groundwater, so stream levels don't fluctuate dramatically, during either the wet and dry seasons, even in cropland watersheds. 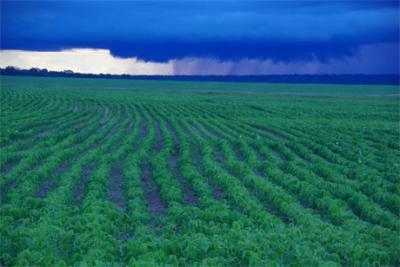 This shows rain over a soybean field at Tanguro Ranch in the Upper Xingu watershed, Mato Grosso, Brazil. Intensive crop farming in the Amazon depends on regular rainfall, but lower amounts of water returned to the atmosphere from cropland compared with forest has the potential to change rainfall amount and timing over large areas. "We don't see large changes to the structure of stream channels in small headwater streams, " Neill says. "But in the bigger rivers, we see a cumulative impact of all the extra water from those small streams piling up. When larger rivers have to handle that extra water caused by deforestation, they change geomorphically; their floodplains get re-arranged. Those are also rivers that people use for water supplies, fishing, and transportation. " Finally, the study showed that the agricultural streams were warmer than the forested streams, caused both by a reduction in bordering forest and the presence of impoundments (small man-made dams). "Warmer water has implications for the fish," Neill says, "because it holds less oxygen. Warmer water also increases fish metabolism, so fish need more food. We don't know if warming and other changes associated with expanding cropland also increase fish food supply—if they don't, some fish may not have enough energy to survive." Neill has been working at Tanguro Ranch since 2007 with collaborators from Woods Hole Research Center, Brown University, the Amazon Environmental Research Institute (IPAM), and the University of São Paulo. Other authors in this journal issue include MBL Senior Scientist Linda Deegan; Shelby Riskin and Gillian Galford, both of whom graduated from the Brown-MBL Graduate Program in Biological and Environmental Sciences; and Brown-MBL faculty members Stephen Porder, Leah VanWey, and Jack Mustard. "Tanguro Ranch is the focus of a huge amount of the science on land transitions and social-ecological dynamics in the Amazon," says Marty Downs, associate director of Brown University's Environmental Change Initiative. A thin strip of streamside forest runs through a fallow soybean field at Tanguro Ranch in headwaters of the Xingu River in the Brazilian Amazon. Deep and permeable soils may buffer streams against pollution from nutrients running off agricultural fields, but narrow forest buffers do not fully protect streams against warming temperatures caused by loss of watershed forest cover.